Get inspired or check out what's new! "Only Teamup offered the best flexibility to view multiple calendars as well as easy visibility. It keeps everything in one place." "We have staff members go around to the parks in the evening and they take a cell phone with the Teamup app to check on the activities in each park. If they need to add anything they add it to our “Observations” calendar which we then get an email notification once they’ve made comments. This allows faster responsiveness to issues such as broken or damaged items in our parks." 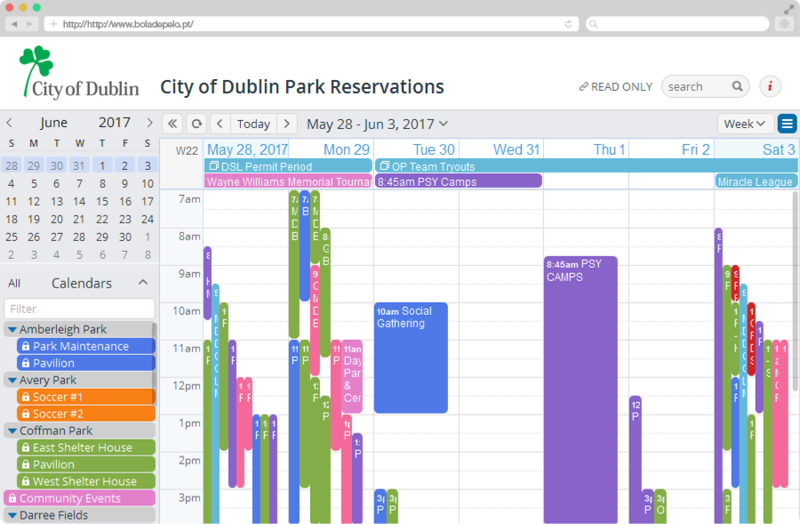 No risk of double booking or underused resources when your reservation calendar is a Teamup calendar. Use it to book everything from rooms and equipment to trucks, cranes, and even planes. "We're using it as a booking system for a car club. Teamup is brilliant for allowing us to manage bookings without any hassle or administration costs. Members just block out the times they want a car. The colour-coding's great because we can see at a glance which cars are in use and which are available. Thank you for this fantastic tool." A staff calendar keeps everyone up to date. Everyone manages their own calendar - no user accounts required. The result: It's easy to know where everyone is and who's working on what. All updates are accessible to the whole team in real-time. "I LOVE this calendar – has completely changed how we communicate as a team – just awesome! Communicate easily with a mobile crew. Manage people, jobs, delivery status and resource planning from one central crew scheduling calendar. Instant updates ensure everyone is kept informed. "This eliminated an entire process that we went through for crew scheduling... We have been able to customize a calendar view for each different group, and the two of us in the office are the only ones who see the entire thing, and the only ones who can edit. Each week, as we put our crew schedules in, we make comments about how awesome this calendar is for us." "Your calendar has become an instrumental part of our most important processes. We are a Mechanical Contracting company specializing in Commercial HVACR service. We use the calendar to dispatch our technicians." When taking a team to a tradeshow or a large conference, it is important to plan carefully to avoid scheduling conflicts and make sure all activities including meetings are well coordinated. With Teamup all updates are instantly accessible to everyone, even if you are offline! "In the past we created a shared 'Tradeshow' calendar in MS Outlook to schedule the meetings, but there were always issues with time zones either while scheduling or once we arrive on site. I discovered Teamup about a year ago. It was clunky at first, but was still our best solution." "This is a really cool app." "I have been overwhelmingly satisfied with your product! It is exactly what I was looking for to coordinate schedules in my mid-sized private mental health group practice." "I recently found your calendar and really LOVE it! We use the calendar to schedule Overtime Availability. The staff are configured to have Modify-from-same-link, no details access." 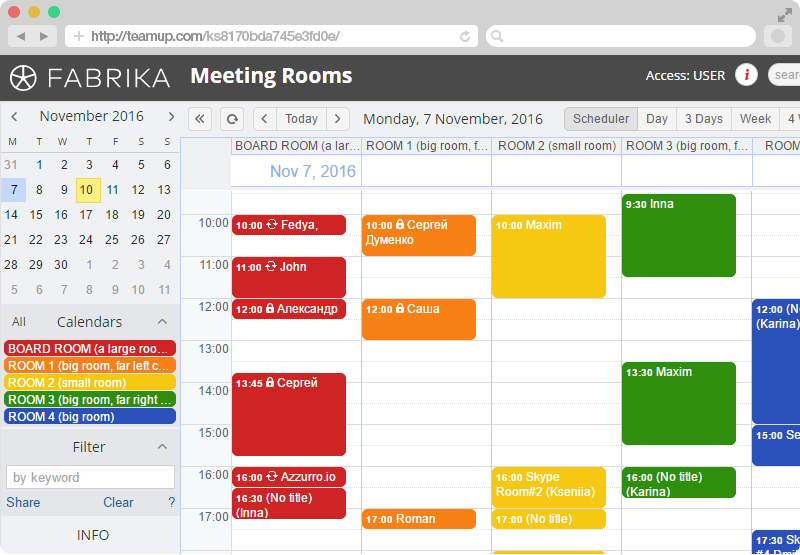 A Teamup-powered conference agenda makes it easy to glance the whole program with color-coded tracks, topics, and rooms. Conference organizers may continuously update the schedules weeks leading up to the event opening date, make last minute changes and be able to share with everyone instantly. Conference goers may access the latest agenda anywhere at anytime on any devices, or import official agendas and coordinate onsite team activities. Say good-bye to endlessly updating spreadsheets or PDF attachments. Keep it simple. Make it beautiful. And enjoy more time to experience the conference! Event calendars show all events on one page with detailed drill down options. Color code event categories, filter and share with anyone anytime. Great for schools, non-profits, sports clubs and corporations. "We're a team spread out across Australia, and use Teamup to keep everyone updated with events taking place in major cities around the continent. Thank you for creating this platform for us." "We are a direct sale company. We use it as a company wide calendar for events." " We have 1000 and growing members in our organization (USMES) which manages a cycling team, triathlon team, running team and adventure racing team. Our team is split up into regions around the world and each region has a calendar of local events and we have a few additional calendars of national events (for each of the team sports) which ID's our biggest events, and a calendar for our camps. We love the filtered viewing options and flexibility of Teamup." "Thanks again for your wonderful product, I am so glad I found it, it has really helped us getting the tennis courts more efficiently used, and saved the members from coming to the club without getting a court." "The implementation of Teamup's different URLs for various access permissions is an elegant solution for allowing members to add entries but not change existing bookings. Our members like the ability to see court availability and book courts online without having to go to the clubhouse noticeboard, which was how it used to work." "Everybody has absolutely loved having Teamup and have chosen to hopefully continue with it in the future. So many people use it every day as a resource to know when their children are playing and where they're playing. Teamup has definitely built a product that is such a necessity beyond belief." “I was googling the pros and cons of MS v. Google cloud solutions for group shared calendars when I came across Teamup, I liked what I read and within 30 mins I had abandoned the One Drive versus Google Calendar research and had a test team calendar up and running using the free version you offer. I expect to upgrade in due course. The key was finding a solution which allowed users remote access to a calendar without them needing to have their own company email account and login. Darcy York, Barcelona Study Abroad Experience, Spain. Organize your team better today! You can also start with a free trial of paid plans with more features, or get inspired by browsing what others say and our million thanks.